Kaukji's forces had entered Palestine illegally during the mandate. By this time they had been reduced to about 3,100 troops, by one estimate ref , or perhaps about 1,500 - 2,000 in rather poor condition (Gelber 2006, page 221) and divided into 3 reduced brigades. Yarmuk brigade included Lebanese and other volunteers and operated in the hills south of the Acco-Safed road. Yarmuk 2 was deployed against Safed between Miron and Sasa, and Yarmuk 3 held the western side of the pocket, based in Tarshicha. Additionally, there were about 900 Palestinian irregular troops. Kaukji did not feel bound by the UN imposed cease fires and continued to carry out local attacks during the months of the cease fire. On October 22, Kaukji began a surprise attack with his reorganized forces on Kibbutz Manara, located on the western hills overlooking the "finger" of the Galilee. They took the strongpoint of Sheikh Abed between Manara and Misgav Am and repelled attacks of local IDF units and ambushed reinforcements rushed to the aid of Manara. Notably, the Carmeli brigade lost 33 dead and 40 wounded (Gelber, 2006, p 223). Manara and Misgav Am were cut off, and there was a fear that the situation would deteriorate further. Israel's protests in the UN were futile and did not change the situation. On the night of October 28, IDF launched operation Hiram, named after the king of Tyre who had been an ally of king David and king Solomon. The mission was defined as "Destroy the enemy in the central Galilee pocket, gain control of the entire Galilee and put in place a defense line at the northern border of the country. 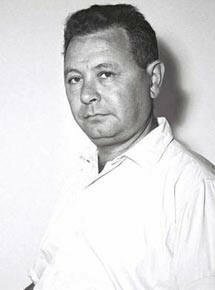 The operation had been meticulously planned in August of 1948 by the staff of the northern front under the command of Moshe Carmel. Instead of attacking the point of attack chosen by Kaukji, operation Hiram was carried out as a pincer movement, with the pincers meeting at Sasa close to the Lebanese border, and enclosing the Arab pocket in the Galilee. The operation was carried out by four brigades (these were not full strength brigades but probably included about three battalions at this time): Seventh brigade commanded by the Canadian MACHAL volunteer Ben Dunkleman, including an armored brigade, Oded brigade, Golani and Carmeli. In addition a unit of Haifa militia or "guard" were included. Oded brigade included a platoon of Druze and Seventh brigade included a platoon of Circassians. These two brigades carried the brunt of the attack, with secondary tasks for the others, who were deployed against the possibility of a Syrian or Iraqi attack. The main thrust was carried out by Seventh brigade, which operated out of Safed and conquered Mt. Meiron and Meiron junction. The advance of the armored battalion of Seventh brigade into the depths of the mountainous Galilee following up on the first successful attack, was decisive for the success of the operation. On October 29 the brigade conquered Safsaf, (today the Safsufa Moshav) and Jish (considered to be the site of Gush Halav described by Josephus Flavius) and on the following day the village of Sasa was conquered by Seventh brigade and Oded brigade. The battle that took place nearby was the most important in the operation, and it the course of the battle the battalion sent as reinforcements by the Syrian army was destroyed. The village of Sasa itself surrendered without resistance, though later rumors spread of Israeli atrocities in Sasa, Eilaboun and some other villages. Golani brigade forces initially moved out of Ilaniya (Sejera) northwest to Eilabun as a diversionary move, but were stopped before reaching the village, which they captured only on October 30 at dawn. Kaukji ordered delaying tactics, which became a general retreat after the conquest of Miron junction by the IDF. The ALA escaped north to Lebanon by a route that was evidently unknown to the IDF and got its entire force to Lebanese territory in the course of two days. Golani moved north from Eilabun to capture Maghar and later Ar-Rama, and from there continued west to Majd el Krum, where they met the Haifa guard forces who had arrive from the west. Additional Golani forces captured Peki'in in the same day. Oded brigade that had been originally stalled in the Tarshicha area, captured the village without a fight on the 30th of October, and then moved east following the ALA. The next day, they took control of the entire northern road between Kibbutz Eilon and Sasa, and reached Ras an Naqoura without a fight. 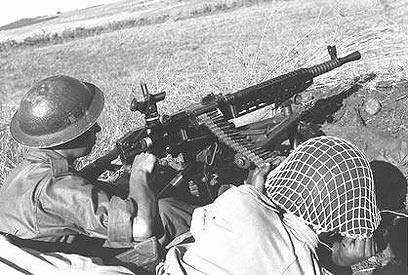 On October 31, Seventh brigade captured Malkiyeh and continued north of the Lebanese border. Carmeli brigade's mission was initially holding back the Syrian army in the Mishmar Hayarden region and defense of Manara. However, with the withdrawal of Kaukji, central command decided to exploit the success, and Carmeli attacked from the region of Manara and Misgav Am beyond the Lebanese border, with the help of the Seventh Brigade. During this coordinated attack, both brigades reached the Litani river, conquering 14 Lebanese villages that were evacuated as part of the Israeli Lebanese armistice in March of 1949. After October 31 the entire Galilee was under the control of the IDF, save for the Mishmar Hayarden pocket held by Syria. The entire operation was complete in 60 hours. The Arab dead in operation Hiram are estimated at about 400, half of whom belonged to the Syrian battalion that was ambushed. About 550 prisoners were captured as well as a lot of equipment. Israeli casualties were apparently negligible and are not given. The ALA finally began to disintegrate and its troops deserted and returned home. 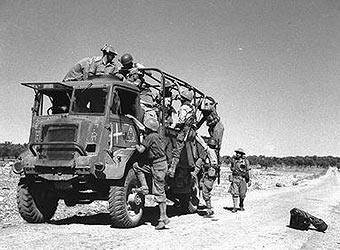 Operation Hiram was the last and largest of the IDF initiatives in the northern front during the First Arab-Israel war. In the framework of Operation Hiram, IDF forces conquered the villages of Ikrit and Birim among others, and after taking over, the security authorities required the villagers to leave their homes "for security reasons" with the promise that they could return when quiet returned to the north. However, the promise was not fulfilled, and the fight of these villagers to return to their lands continues to this day. They were offered, but refused, alternative compensation. 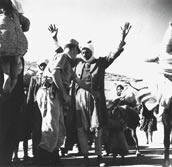 A large number of Arabs left or were expelled during operation Hiram. Arabs have claimed that there were massacres and rapes in several villages and Benny Morris (1999, 2004) has claimed that there were two somewhat contradictory telegrams from Operational Commander Carmeli calling for ethnic cleansing. The telegrams however, were both sent on October 31, after all the alleged massacres and the flight of the Arabs had taken place. Morris admits that in fact there was no systematic ethnic cleansing and many of the villages remained intact. ref Villages like Jish, Maghar, Tarshihah and Majdl Krum among others, remained more or less intact. Had there been a general order to expel Arabs, that would have been impossible. Moreover, Israel was making allies among the non-Jewish population, including the Druze and Circassians. A policy of random violence would not have been conducive to making allies. About half of the acts of massacre were part of Operation Hiram [in the north, in October 1948]: at Safsaf, Saliha, Jish, Eilaboun, Arab al Muwasi, Deir al Asad, Majdal Krum, Sasa. In Operation Hiram there was a unusually high concentration of executions of people against a wall or next to a well in an orderly fashion. Morris does not explain how an order issued on October 31 could have been responsible for massacres that allegedly took place on October 29. �I never saw anything like this, either while it was allegedly going on or after it had transpired. After the mixed Christian/Muslim town of Jish, the first place we attacked, I did see virtually every Arab village on a line between Safad and Kadesh on the Lebanese border during Operation Hiram, and the pattern was: villages occupied by Christian Arabs unharmed; Muslim villages deserted, long before any Israeli troops got there. This is not proof positive that there were no massacres, but it is indicative of the attitude of at least some of the Israeli forces. Indeed, a force of four brigades would have had no trouble expelling all civilians in an orderly manner had they been ordered to do so, so there was no rationale for allowing massacres. The Seventh brigade was commanded by Ben Dunkleman. Dunkleman had also commanded the Seventh brigade in Operation Dekel, in July when orders were given, apparently by Carmel, to expel the population of Nazareth. Dunkleman allegedly refused and was eventually backed by David Ben-Gurion. Most of the alleged massacres occurred in the area conquered by Seventh brigade. It is hardly credible that having refused expulsion orders in Nazareth, Dunkleman would have permitted massacres in Operation Hiram. Following consultations with the Minister of Justice and the General Prosecutor, Ben-Gurion ordered an investiagtion into the massacres at four villages: Salakhiya, Safsaf and Jih in Galilee and Hula in Lebanon... The investigation did not yield unequivocal findings. The investigating officer, Emmanuel Vilensky (Yalan), visited the sites and questioned commanders and staff officers. They claimed that the events took place in the midst of combat, while expecting enemy's counter-attacks, or due to the troops' difficulties in discerning between ALA soldiers and civilians. Senior commanders fully backed their subordinates and denied that undisciplined behaviour on the troop's part had been the cause for these outrages. Nonetheless, at least in one case an officer was court-martialed and sentenced to several years' imprisonment. (Gelber, 2006 p 226). It is thus not entirely true that the Ben-Gurion silenced the matter, as Morris asserts, or that there were no punishments, and it is not so likely that Ben-Gurion was responsible for expulsion orders. The investigative procedure however, was less than satisfactory to say the least. Gelber goes on to relate that other instances were apparently covered up, especially a massacre in Eilabun that was revenge for beheading of an IDF soldier. He also explains why less villagers fled than in previous campaigns. Morris, Benny (1999) "Operation Hiram Revisited: A Correction" Institute for Palestine Studies V. 28, no. 2 (Win. 99): 68-76. Morris, Benny (2004) The Birth of the Palestinian Refugee Problem Revisited Cambridge: Cambridge University Press. 'H - ('het ) . In Arabic there are several letters that have similar sounds. Examples: 'hanukah, 'hamas, 'haredi. Formerly, this sound was often represented by ch, especially in German transliterations of Hebrew. Thus, 'hanukah is often rendered as Chanuka for example. chh - (chaf) a sound like "ch" in loch or the Russian Kh as in Khruschev or German Ach, made by putting the tongue against the roof of the mouth. In Hebrew, a chaf can never occur at the beginning of a word. At the beginning of a word, it has a dot in it and is pronounced "Kaf."